Those of you who live in Heaton know that Belle & Herbs sadly closed just before New Year. There have been a large number of rumours kicking around as to what happened, everything from regular financial difficulties to some sort of coup by an investor, taking the business from the original founder. Whatever has happened, we’re gutted. Though we’d been accused of losing interest in B&H, in reality we had just covered the menu* (which is what we originally set out to do) and we continued to go there very regularly, enjoying our favourite meals. The location itself is reopening under a new name, but the level of vitriol and unprofessionalism** on the Facebook page frankly makes us want to avoid rather than try it out. It also seems the new cafe doesn’t have the involvement of the original founder of B&H, who over the past 5 years was a big part of the Belle & Herbs experience for us, so we’re a little doubtful that the food will be as innovative, or the atmosphere as good, as once was. * The astute amongst you will realise that we hadn’t covered all the veggie meals. Given we’re not vegetarian we figured most of our reviews would be “would be nicer with real bacon” which isn’t exactly the sort of review anyone wants to read so we accepted defeat on that front. Belle & Herbs’ Banana Pancakes are THE best breakfast option if you’re just after something sweet. 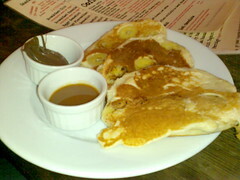 I love the Banana Pancakes (both chocolate and banana – how could I lose?) but the sugar content does leave me bouncing off the walls for quite a while afterwards. This is truly a Belle & Herbs classic: bacon, brie and cranberry on soft white doorstop bread. Just warm enough that the brie is beginning to soften, without actually being a hot sandwich. 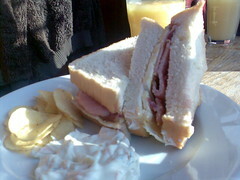 The bacon at B&H’s has been particularly tasty of late – evidence of the superior ingredient sourcing, I think. 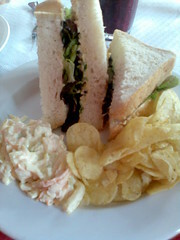 This particular sandwich was absolutely gorgeous – creamy brie, savoury bacon, sweet cranberry and nice soft white bread. I can’t wait to go back for another! The morning after our wedding, the kind folks at Belle & Herbs opened up early so that we could have a morning-after breakfast. My first breakfast as a married woman was steak and poached eggs — two pieces of thin steak, 3 poached eggs, a bunch of hash browns and Bearnaise sauce. It was gorgeous and very filling! The soup + sandwich “meal deal” at B&H is always great value — often more than you can eat in one sitting in fact! 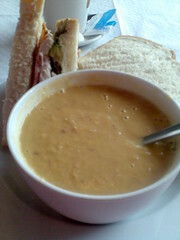 On this particular day, I chose to have the sweet potato and bacon soup and an ABC (avocado, bacon & chicken) sandwich. The soup was great as usual, if a little strangely textured. The sweetness of the potato complements the saltiness of the bacon beautifully. On reflection, the ABC was probably too hefty a sandwich to have with such a thick soup. There’s quite a lot of protein with the combo of bacon and chicken. Unfortunately the avocado wasn’t quite ripe either, meaning, making it a bit underwhelming. All in all, I’d probably have the soup again, but not the combination. On a cold day off, I decided that hot chocolate was the answer. This was the posh hot chocolate, which usually comes with little marshmallows, but on this particular day they had run out, so I got chocolate buttons instead. The combination of the whipped cream and the chocolate buttons (which slowly melted as you drank it) was fantastic, if rather rich. 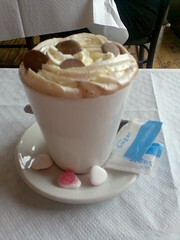 All in all, the perfect drink for a cold, drizzly day in Newcastle! This houmous, black olive and salad greens sandwich is easily the healthiest thing I’ve ever had at Belle & Herbs. I was in the mood for something simple and light and this definitely fit the bill. 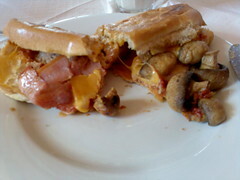 The Breakfast Panini consists of a lightly toased ciabatta, filled with sausage, bacon, mushroom and cheese. Maybe I should put that in order of quantity: cheese, bacon, sausage, mushroom. I think that there was probably a little too much cheese, as this was quite an over-powering taste, however I can forgive them for this, as it was very tasty. The last panini that I ate was in Italy (Florence to be precise), yet Belle + Herbs have mastered this great Italian skill and this panini was better than the one in the home country! It didn’t look that much when it was on the plate, but it was certainly satisfying, and I would definitely have it again. One thing to watch out for though; the bits of sausage are all at one end and the bits of mushroom all at the other end. That confused me, and I wish I had eaten a little bit from either end rather than just attacking it in one go. If you want a taste of Italy, but better, then choose this! The words “Power Smoothie” conjured up visions of a mighty concoction with plenty of substance. It did not disappoint. I couldn’t imagine a beefier drink that didn’t contain meat (this is actually a meat-free drink). From my memory it contained yoghurt, honey and milk, with the real thickness coming from the mashed bananas and crumbled wheat biscuits (I’m not enough of an expert to tell whether it was real Weetabix). 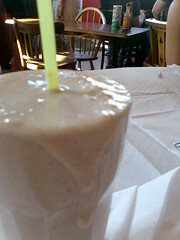 As an accompaniment to a large meal, I found this drink to be a little too much, and it isn’t exactly thirst-quenching. However, if you are too lazy to masticate through proper solid food, I can recommend this as a tasty liquid form of a healthy snack! Being a Belle + Herbs virgin, I had no idea where to start, so I thought I’d just munch on the potato wedges whilst contemplating the best plan to tackle the sandwich. Best potato wedges ever…but then again they were nothing compared to the sandwich. Imagine all the flavours listed above declaring gang warfare on your taste buds, and it doesn’t even come close. Although you practically need jaws which can unhinge to eat this monster, it is well worth the jaw ache. The steak was perfect, and the orchestra of accompanying sauces created a beautiful sonata…nay, symphony in my mouth. The bread too was crispy on the toasted outside, soft on the inside. 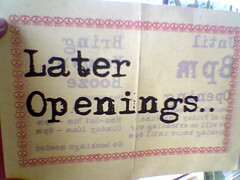 The first day of late openings we went along to Belle & Herbs for supper. I chose to have the cumberland sausages with cheesy mash and red wine & onion gravy, whilst Elly decided on a burger as big as her head. The sausages were up to usual B&H quality and nice & herby. 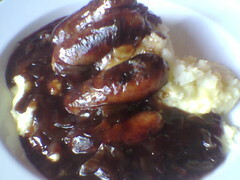 I found the red wine & onion gravy quite sweet, but a very flavourful complement to the sausages. I wasn’t anywhere near as impressed with the mash as we had been previously when Elly had it — then it was light and fluffy, whereas this time I found it a little watery and that there was still unmelted/unmixed grated cheese in the middle. The texture was like someone had boiled the potatoes and failed to drain them properly before just chucking loads of cheese in and half-heartedly mashing it up. That said, the mash was the only weak point and we know from past experience that they can do it better, so I’ll definitely try this dish again. 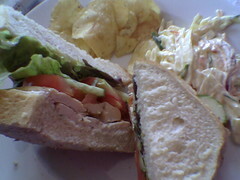 This was a really nice simple sandwich — roast chicken breast, lemon & oregano mayo, lettuce, cucumber and tomato on doorstop white, served with the usual coleslaw and crisps. I had it just before leaving on a business trip and was really glad I’d gone for something nice and simple rather than eating crap at the airport. It was generally just a good meal and I was particularly impressed with the chicken. So often chicken breast is either dry and horrible or overwhelmed by mayo — this was nicely moist and full of flavour. This was one seriously sweet dessert! Sweet pastry, layered with sliced bananas resting on toffee sauce, covered in cream and then toffee swirls and cocoa for decoration. Although this was a little too rich for me personally, it was an excellent example of a great banoffee pie, so if you’re an afficionado definitely something to try. 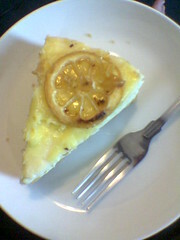 This lemon curd cheesecake was absolutely WONDERFUL. 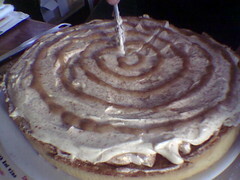 It had a crisp biscuit base, creamy filling and lovely tangy lemon curd and caramelised lemon slices on the top. Overall this was an amazing dessert, with great combinations of sweet and tart, indulgent and refreshing. Definitely going to keep an eye out for this next time it’s in the dessert fridge! Starting today, Belle and Herbs is going to be open for longer. Until 8pm to be precise and from 6pm it’s “bring your own booze”. We’re about to go and have our first supper there, will let you know what the evening menu is like! Pain perdu (or “posh eggy bread” as the menu explains) is another new addition to the breakfast menu. This is essentially just French toast made with brioche instead of normal doorstop bread. We ordered some just to try it along with breakfast one morning. 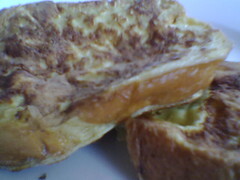 As expected, it was quite a lot sweeter than normal French toast, but I enjoyed it greatly. The texture was very interesting — I’d say the brioche was better than normal bread (not surprising really!) as it withstood the egg/milk mix better. Lovely simple addition to the menu, quite rich but delicious! A rather strange addition to the new mains menu is the hot dog section. 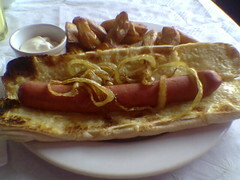 I chose to have the cheese dog on this occasion, which consisted of a roll covered in grill cheese, hotdog and grilled onions, served with chips. It was a nice lunch, but if I’m honest I’m very ambivalent about the concept of posh hotdogs. In South Africa (where I’m from), hotdogs are very much a school sports day/church fete kind of food — they come with tomato sauce and American mustard, wrapped in newsprint and slightly crispy from having been kept warm as they are served to the hordes. Another addition to the new menu, the Pepperoni & Blue burger is a very interesting combination. It’s basically a normal house burger (6oz handmade steak burger, served on a cheese & onion bun with dill pickle, tomato relish, tomato, lettuce, burger mayo & mustard) augmented with a layer of blue stilton and a swathe of crispy pepperoni. To be honest, I was wholly unconvinced by the prospect of the pepperoni and stilton combination and expected it to be a rare disaster. However, the creaminess of the cheese and the spicy flavour and crispy texture of the pepperoni really did work very well. I’m still not sure that a burger is the best vehicle for the taste combo (perhaps a grilled open sandwich might be better? 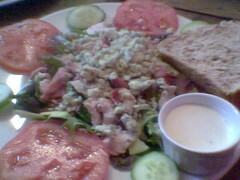 ), but I did really enjoy the meal. 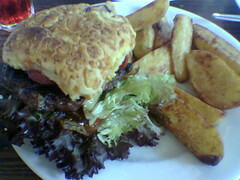 As per usual, however, the size of the burger meant that I didn’t make it through all the chips that were served with it. They were lovely though — crisp on the outside, sweet and a little mushy on the inside — just a little too much to handle after a 4inch tall burger! 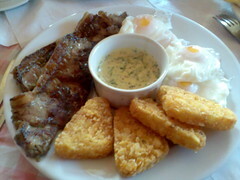 The Full-On English is another augmentation of the main breakfast options on the new menu. It features 2 bacon, 2 eggs, 2 sausage (for some reason I seemed to get 4 though…), beans, peeled plum tomatoes, mushrooms, 2 hash browns, black pudding, white pudding, breakfast sauce, potato scones and toast. As you might expect, this is a seriously big meal. 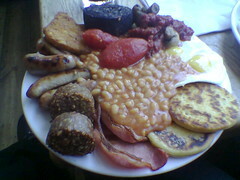 The waitress’ comment was “You’ll never eat all that” and she was right … the volume of beans overwhelmed me for a start! The usual breakfast items were up to their normal high standard — the bacon was nicely cooked, the sausages tasty, the eggs perfect as usual, the hash browns crispy on the outside, soft on the inside (armadillos!) and the mushrooms juicy. The white pudding was nice (although quite heavy on the wheat bulking) although I didn’t have the black pudding, choosing to bring it home for the puppy (I like black pudding, but I have to be in the right mood for it, if you know what I mean). My favourite items, however, were the potato scones, which were lovely and buttery and the plum tomatoes, which were a nice clean contrast to the richness of the other ingredients. Although there have always been good salads at Belle & Herbs, the new menu features an extended salad section. I chose this Cobb Salad, which combines smoked chicken breast, smoked bacon, avocado, blue stilton, mixed greens and ranch dressing, with a nice hunk of bread on the side. This was a substantial meal and delicious. The flavours of the smoked chicken and bacon worked with with the stilton, allaying my fears that one would overwhelm the others. Unfortunately on this particular day, the avocado that was used was unripe and therefore just chewy and tasteless … I’d hope this was a one-off availability issue rather than a regular occurrence. The beef tomatoes were lovely, flavourful and juicy, and the rest of the greens were nice and fresh. The bread wasn’t needed to “bulk out” the meal at all, but it was also nice and fresh. I’m personally not a big fan of dressing, so I didn’t use much, but it was nice enough. Generally I was quite impressed that even the salads are quite luxurious!